One thing you should have down as a musician-entrepreneur. This week, my client was traveling every other day to a new state, so there were a lot of logistics to handle and details to take care of. During the week, I would get emails saying, “We need this!” or “Did this get sent to the pianist?” or “Who’s picking us up?” This was definitely him wondering what has been done / what hasn’t been done. I answered his questions, letting him know an itinerary is coming his way with these answers, but it got me thinking – I’d really like to avoid him feeling like he doesn’t know where his day is headed. This showed to me that he expected his itinerary sooner than I was giving it to him. Maybe now he wants it a week before, whereas before, he was content with having the itinerary a few days before. It was clear that expectations had changed, without the communication. So, I asked him if he wants me to send itineraries sooner and after a yes, I knew from there that he’d rather see an incomplete itinerary with all the information I had planned so far a week ahead, and then update him as details fall into place – driver’s names, added appearances, etc. I realized in that moment, that him being his own CEO, him being a musician-entrepreneur, that he is wanting a better way to find his team (including me) accountable for what he assigns us. Say for example, you hired an assistant (go you!) to help with your logistics or advancing shows or posting on social media. You make the next step and delegate them a task. A few days later, are you wondering if it was done? A panic can set in and you ask yourself, did they do it? did they event start it? is it complete? What to understand here is that as a musician running your own career, you have to hold your team accountable for what tasks they need to complete. Every manager does this, and you have to wear that hat! Truth is, being clear on expectations and managing your team to hold them accountability saves you loads of time and most of all, your energy and stress. For example, your publicist sends a weekly report on Friday afternoons, and does it EVERY Friday afternoon. You now know that if there are any new leads for press or if there is a new feature, they will be sure to let you know then. And if you want it sooner, you know to ask if it’s not Friday. Expectations are clear, what’s in the report is clear, you don’t even have to think about all the questions that might come into your brain of “Will they send this?” “Did they send this?” “did they talk to the New York Times?” OR waste time following up or asking them these questions. So to save YOU time and energy, here are some quick tools that I use myself to hold a team accountable. 1) Set your expectations and make them clear – Give deadlines and be detailed as much as possible. Otherwise, how can you expect results when you want them and how you want them? This way, your assistant knows when you’d like it done and how they should let you know it’s done. This saves a lot of headache in the future. 2) Ask them to send a report – If you’ve set them on a task to do research or you simply want to know what they did that week, let them know you’d like a report on the results and set how many a week and when that works for both of you. Every Thursday afternoon, every morning, every Monday, Wednesday and Friday. Doesn’t matter, this is up to you. 3) For small tasks, ask them to send you a quick reply when it’s done – For tasks they can handle in the day, like checking voicemails or emailing someone back for you, ask them to send you a quick “done” or “complete” when they’ve done it. Ask them to do it the first time and for all future tasks like that and you’ll never ask again. 4) Ask them to build a checklist – This is really helpful for things like advancing a show or coordinating travel. Ask them to build a checklist that can be shared with you (Google Docs!) and to keep it updated with what has been done as far as advancing a show or booking your travel. You can go in and see what has been done and not have to waste a) time following up and b) energy/stress on wondering if it was done. See my post a couple of weeks ago about checklists! 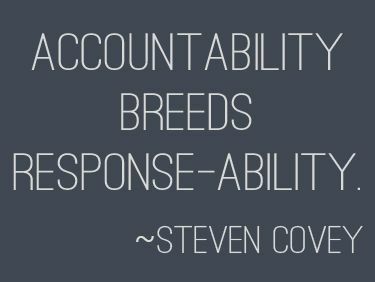 Do you have other ways you hold your team accountable? I’d love to learn from you, too – just hit reply to share. If you are just starting to build your own team, or have had a team and want to make them even better, keep these tips in mind when holding them accountable. Everyone will be happier in the end.